This post does not have as much detail on each design yet. I have had a lot of Dyson ramekins stored away so I though it time to get them out. June Dyson was a prolific potter who produced many different designs over a long period of time. Most of her output was hand made and glazed, sometimes I think that she must have applied her glaze with a shovel because it appears to be so thick. 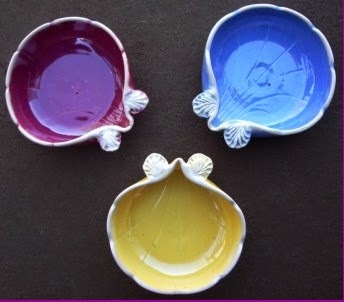 Anyway, her are many of her ramekin designs. June spent her early years in Tennyson Street St Kilda (an inner suburb of Melbourne) and enjoyed the social scene thanks to her socialite mother Mrs (Edward) Dyson. Her father, Edward Dyson was a successful poet and author and her uncle Bill, a revered political cartoonist and the Australian Government's official war artist during the First World War. In her early 20s, she commenced studying pottery at the Royal Melbourne Technical College under the legendary John Barnard Knight and Klytie Pate. The Dyson Pottery studio was based in Melbourne at their home, 12 Arkaringa Crescent Hampton. Her husband Colin Mervyn Gordon is recorded as being her business manager but is shown as a potter on the Electoral Rolls. In 1958, she opened another studio in Gembrook in the Dandenong Ranges. The area was a favourite amongst potters. William Ricketts had worked in the area for decades. Most of her ramekins are incised “Dyson Studio”, but some of her pieces are incised with "Lorrant Studio" and are press moulded, mostly in good condition with a few glaze bubble spots from firing and some minor wear marks. Lorrant is, according to Ford, her maiden name. It was actually Dyson, so where “Lorrent” comes from, I do not Know. This mark was only used at the start of her career in 1945 and changed to “Dyson Studios” in the late 1940s. June formed a working, as well as a personal partnership with her scientist husband Colin who became the company's Business Director. It was June's second son Andy, who showed most interest in the pottery, helping out in her studios from his early twenties. Some of her ramekins show her traditional style of making but have a hand-painted interior that shows up in later Robert Gordon pottery. Unlike most of her earlier work, these have a signature written in black pencil to the slip on the base. Maybe this is an early example of Robert helping in his mother’s studio? June produced thousands of items, some plain, like these ramekins, some decorated, like the cornflower pattern on some ramekins and other work. A slightly rough and ready style is indicative of Dyson's studio ware. 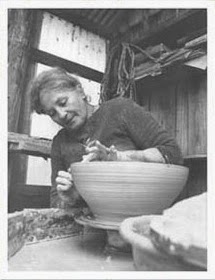 June continued her own work until the late 1980s, but continued with the Warrandyte potters almost until her death. Her son, Robert (Andy) Gordon began working on his own as a potter in 1979 in Gembrook in the Dandenong Ranges, north of Melbourne and the successful Robert Gordon Pottery continues today near Pakenham in Melbourne’s outer south east. Robert and wife Barbara now export to many other countries.